To enable the REST API within WooCommerce, go to WooCommerce > Settings > Advanced >Legacy API and tick the Enable REST API checkbox. Note: REST API was found at WooCommerce > Settings > API prior to WooCommerce 3.4. Go to: WooCommerce > Settings > Advanced > REST API. Note: Keys/Apps was found at WooCommerce > Settings > API > Key/Apps prior to WooCommerce 3.4. Select Add Key. You are taken to the Key Details screen. Select the User you would like to generate a key for in the dropdown. 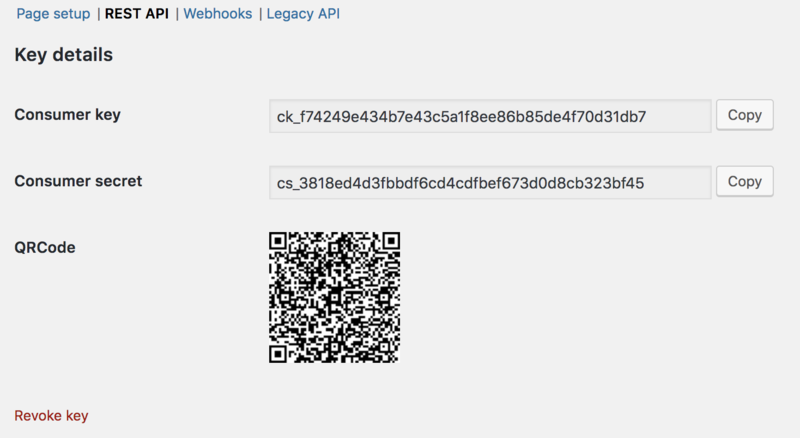 Select a level of access for this API key — Read access, Write access or Read/Write access. Select Generate API Key, and WooCommerce creates API keys for that user. Now that keys have been generated, you should see Consumer Key and Consumer Secret keys, a QRCode, and a Revoke API Key button. The Consumer Key and Consumer Secret may be entered in the application using the WooCommerce API, and the app should also request your URL. Find the REST API documentation at: WooCommerce REST API Docs.